What a busy little summer it’s been. We are now officially in to September but before I change my flavour profile in the kitchen, I needed to get the last hints of summer on to my dinner plate. Fresh tomatoes are probably the best thing about summer. 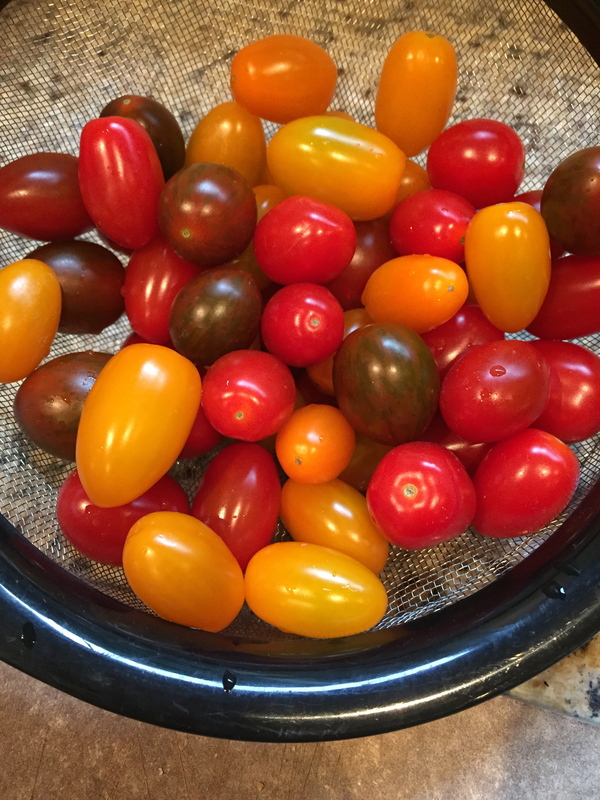 What’s even better are those delicious little cherry heirloom tomatoes that come in all different colours because they truly make that plate pop!! Tomatoes with basil is seriously one of the best flavour blasts of all time! To me, it’s freshness to the max. 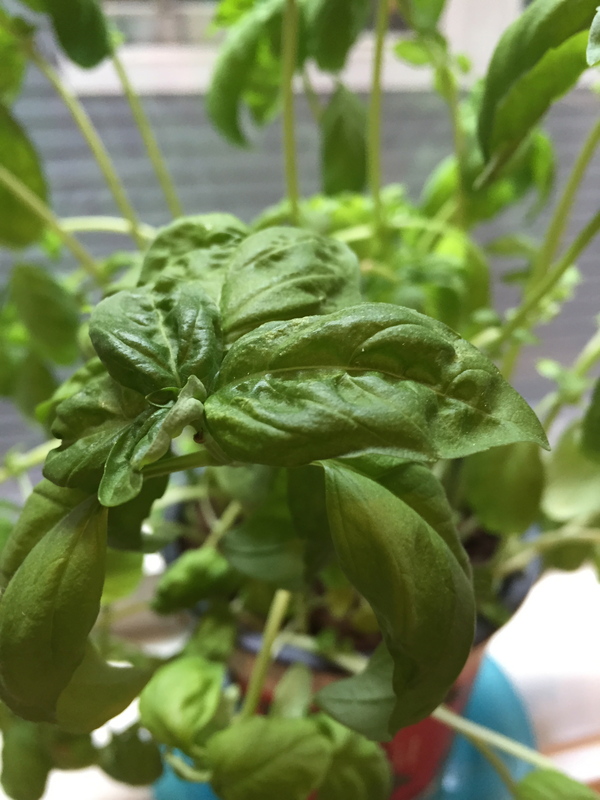 On a side note, one of the things I am most proud of this summer…besides, launching a new program at work, coordinating a cross provincial move, appearing on ‘That Talk Show’ and catching up with old friends is…ready…wait for it…I was able to keep my Basil plant ALIVE!! Can I get a WOOT WOOT?? Seriously, you have no idea how major this is for me. Normally those little punks are dead within 2 weeks for me. Not this time my friends!! The Proof…my basil plant is still alive!! So whats a girl to do when she has a blooming basil plant, some killer cherry tomatoes and a beauty baguette in the house?? 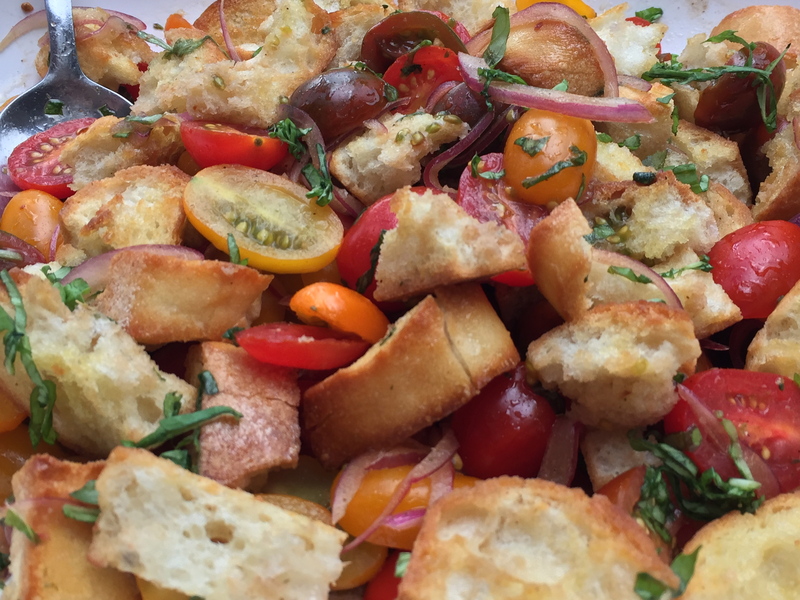 Yup, you got it…make a panzanella salad. What the heck is that? 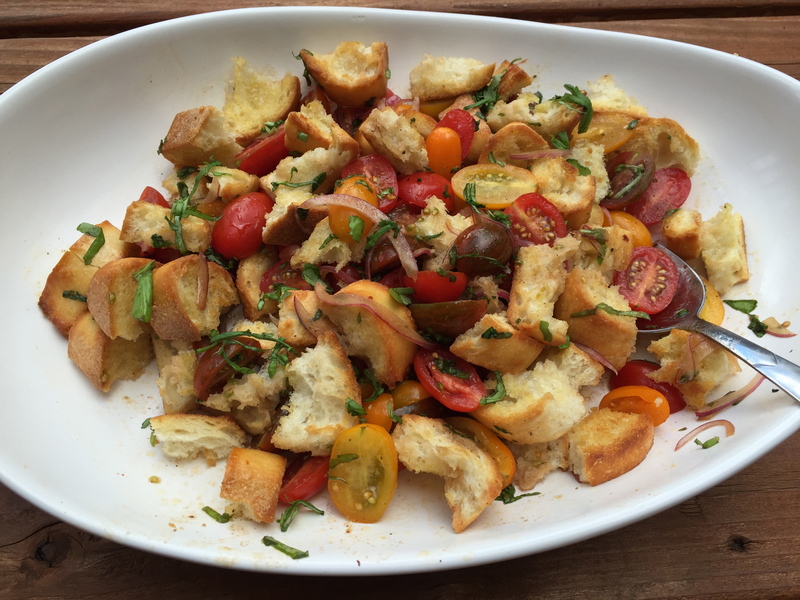 It’s a lovely little Tuscan tomato salad with chunks of bread in it. Often times, people tend to make this salad when they need to use up some day old or stale bread. This is a super simple salad that fills you up completely, is packed with flavour and is always a crowd favourite. First you want to get all of your salad ingredients ready because you want them to marinade for a little bit to give all of those glorious flavours a little time to cosy up together and get acquainted. So get you a big platter (you will mix it directly in the platter) and set aside. 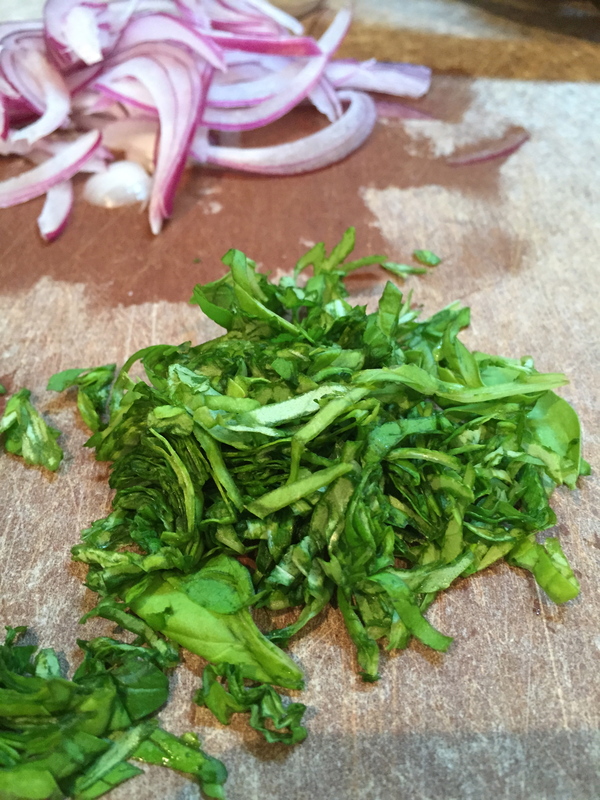 Chop your onions really thin, like almost little slivers and then take about 10-12 basil leaves and chiffonade away. Remember, Chiffonade is a just a super fancy way of shredding your basil really fine. 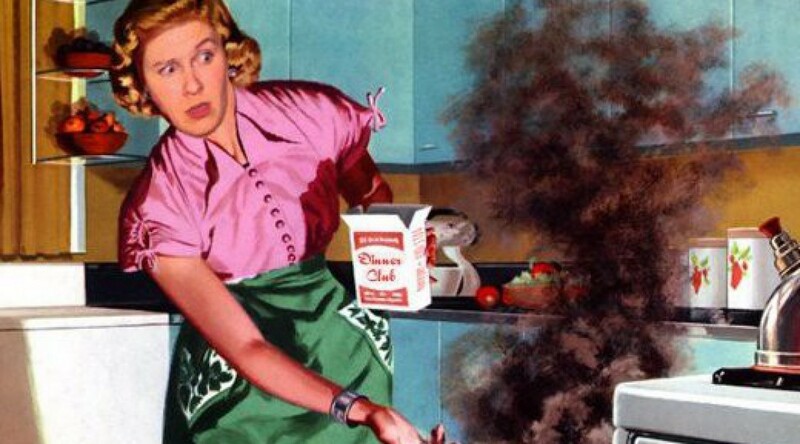 Roll the leaves up like a …Cigar, yes, like a Cigar and then use your knife to chop it really fine. The end result will be super fine strands of basil. Put them both to the side of your cutting board. 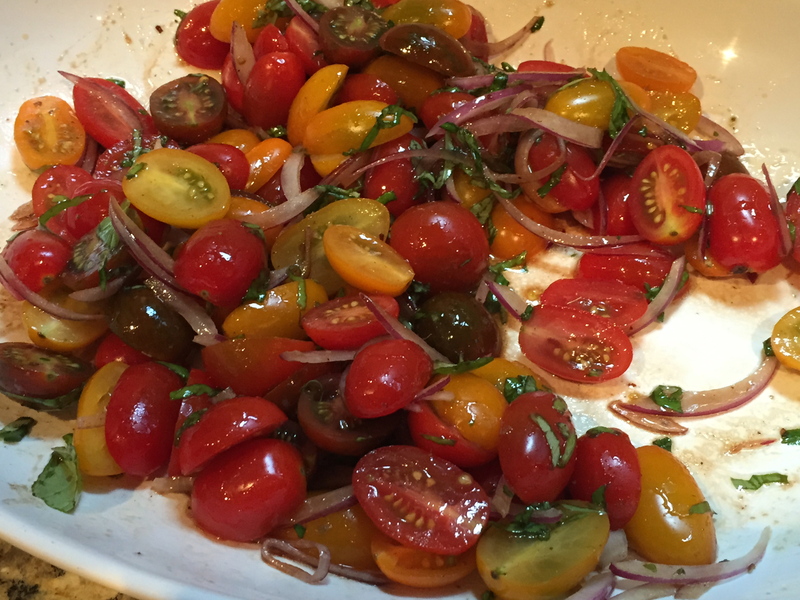 Next you will want to take about 4 cups of cherry tomatoes and slice them in half. When you are done, throw them directly in the platter. Looks at those little gems!! Add the onions, basil, salt, pepper, Extra Virgin Olive Oil, a pinch of dried oregano and dried chilli flakes (omit if chilli flakes aren’t your thing) and then drizzle a bit of balsamic vinegar over the mixture. Toss everything together and let it sit for about 25 to 30 minutes to let all those flavours come through. Next slice your bread in to 1/2 inch pieces and then place them on a cookie sheet. 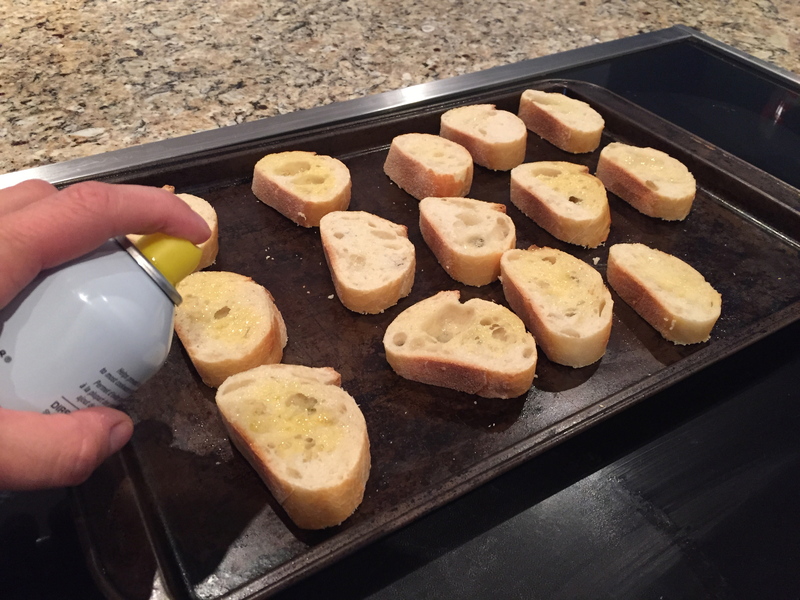 I sprayed mine with an olive oil spray I had because truthfully…i had no desire to brush the bread with actual olive oil. It’s a weeknight people so let’s get real here. Most Panzanella Salad’s don’t actually require you to toast your bread but seriously, I thin it adds major flavour and I absolutely love the contrast that it adds in the salad. It gives you a nice balance of soft, fresh and crunchy. YUM. 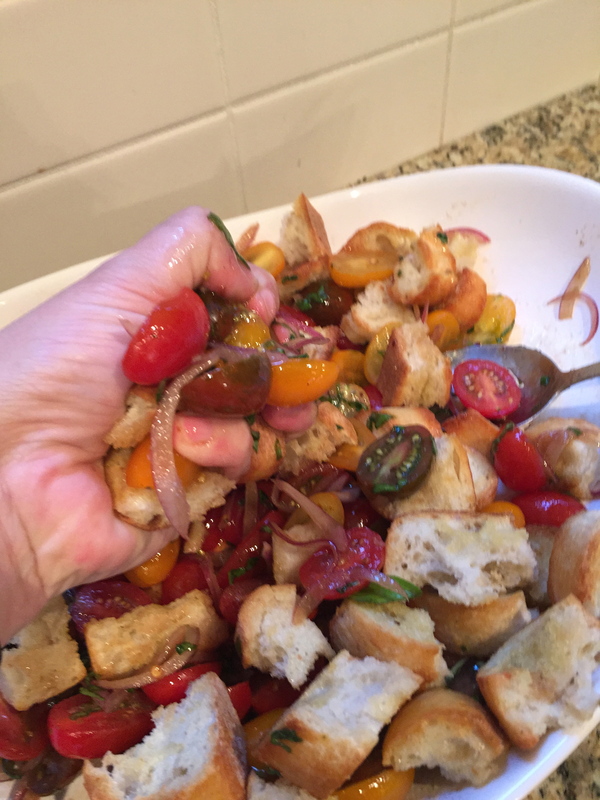 I like to take a few handfuls of the bread with the tomato mixture and squeeze them in my hands. This allows that lovely dressing to get right in to the bread. Don’t over do it because you still want some crunch right? And here you have the final product. Look at this close up goodness!! 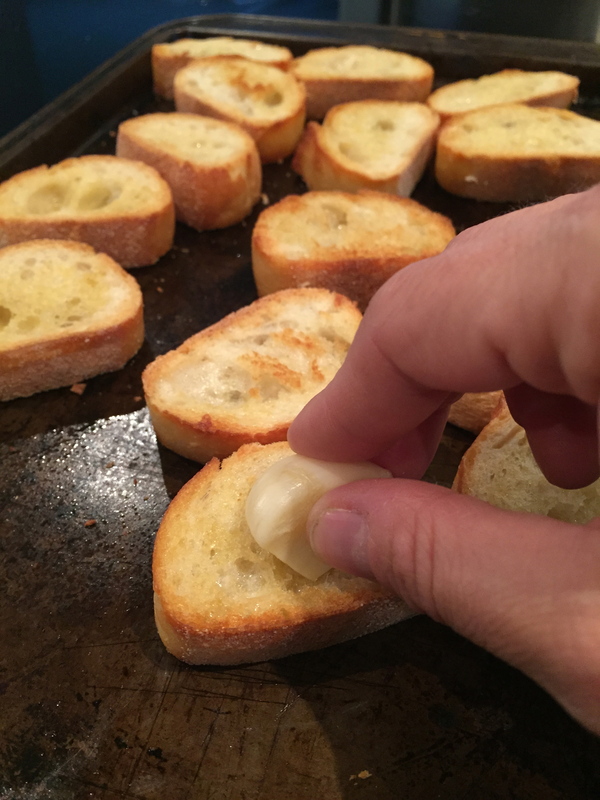 EVOO spray or olive oil to brush on to bread. Let bread cool for 2 minutes. 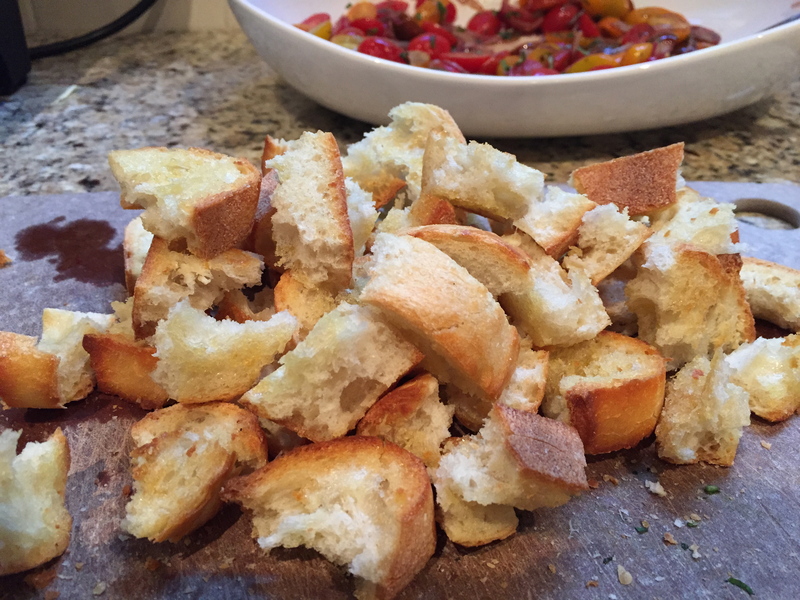 Tear the bread in to bite size chunks and add it to the platter. Mix everything together and serve. Seriously my moody friends, this salad was super easy to prepare and it’s perfect for a week night meal. It’s also a great thing to serve at a BBQ with some mozzarella or even some bbq’d meat. Both me and the husband really enjoyed it. I hope you do too! !